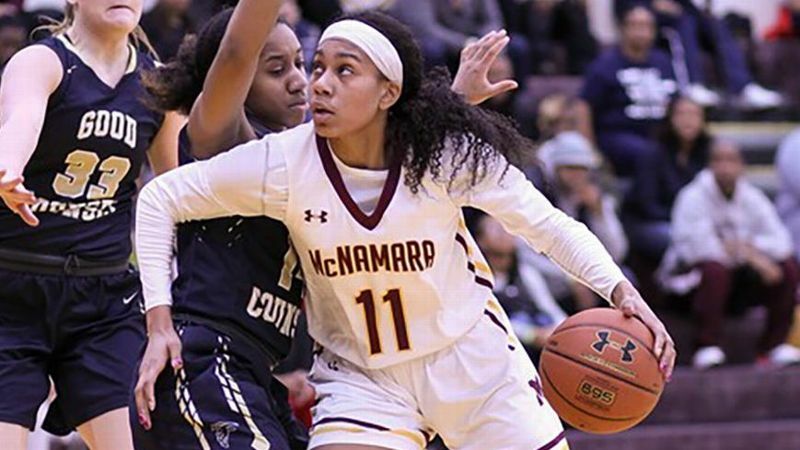 Women's Basketball player from Bishop McNamara High School, Jakia Brown-Turner '19 (pictured here in action against Good Counsel), among ESPN.com's 12 high school stars who belong on your radar, along with teammate Aliyah Matharu '19, making up one of the "most dynamic duos in the country". Senior forward Jakia Brown-Turner has the athleticism, quickness and range to carry a team all by herself. At Bishop McNamara (Forestville, Maryland), the NC State recruit won't have to. Brown-Turner is coming off a junior season in which she averaged 19.8 points, 6.0 rebounds, 2.0 assists and 1.9 steals. She teams up with point guard and Mississippi State recruit Aliyah Matharu to form one of the most dynamic duos in the country. Looking forward to a terrific season, Lady Mustangs!